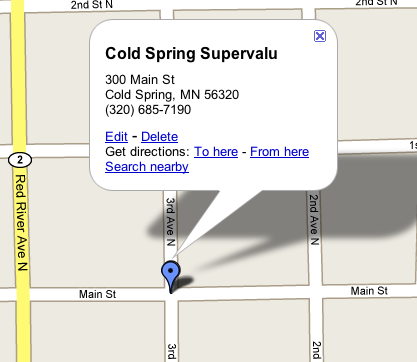 Supervalu is your local full service grocery store in Cold Spring. Along with fresh produce, the finest meats, and great product selection Supervalu is committed to servicing our customers better than anyone else can serve them. In addition we see ourselves as partners in the community, and we are committed to provide time and resources to help keep our community strong and vibrant as a partner, neighbor, and friend. At Supervalu we blend together price, service, and selection to best meet the needs of the people we serve.